NOTE: I RECEIVED THIS BOOK FREE FOR REVIEW. Synopsis: Join Carole P. Roman and visit the lovely land of Italy. The exciting series travels through the stunning streets of Italy. 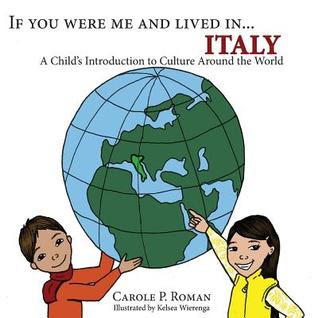 If you were me and lived in Italy - a child's introduction to culture's around the world discovers what life could be like for children in this captivating country. The book touches on many familiar topics such as names, currency, popular games, sports and delicious foods as well as the sights and sounds that come with living in Italy. Review: This children's book is definitely an interesting read and it is a fun way to learn about other countries. The fact that there is only a short amount of text and plenty of images makes this the perfect book to teach children as they will not lose interest in the book. If you are a teacher and/or parent then it would be good to have the full collection of books so that children can learn about multiple countries in a fun and easy way.